We invite school children, tertiary students and corporate groups to work with us. NATIONAL TREE DAY: In July each year the PUL group organises a National Tree Day event with a mass planting of small native trees and shrubs. Get involved and help us to bring the bush back to the city. A delicious morning tea included. You can register on the Planet Ark website or RSVP to Mary Mortimer on 0410 679 204. PAST NTD EVENTS: On Sunday 30 July 2017 9.00am at Wentworth Park light rail stop a group of volunteers joined our regular landcarers for planting followed by a delicious morning tea. On Sunday 31 July 2016 PUL joined the City of Sydney and Planet Ark at Jubilee Park in Glebe to celebrate 21 years of National Tree Day. 2000 trees were planted. 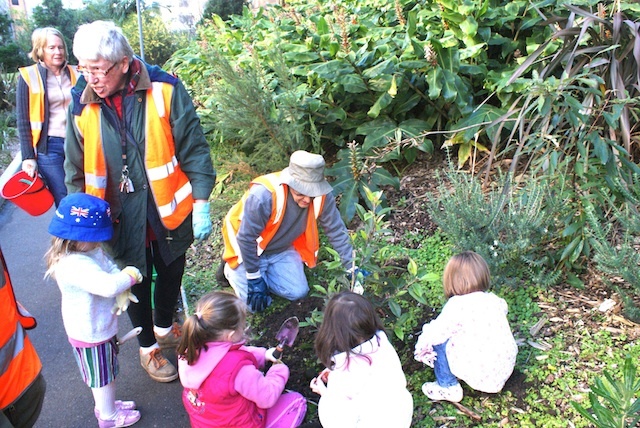 Planet Ark’s National Tree Day 2016 at Jubilee Park Glebe. Celebrating 20 Years of planting trees.